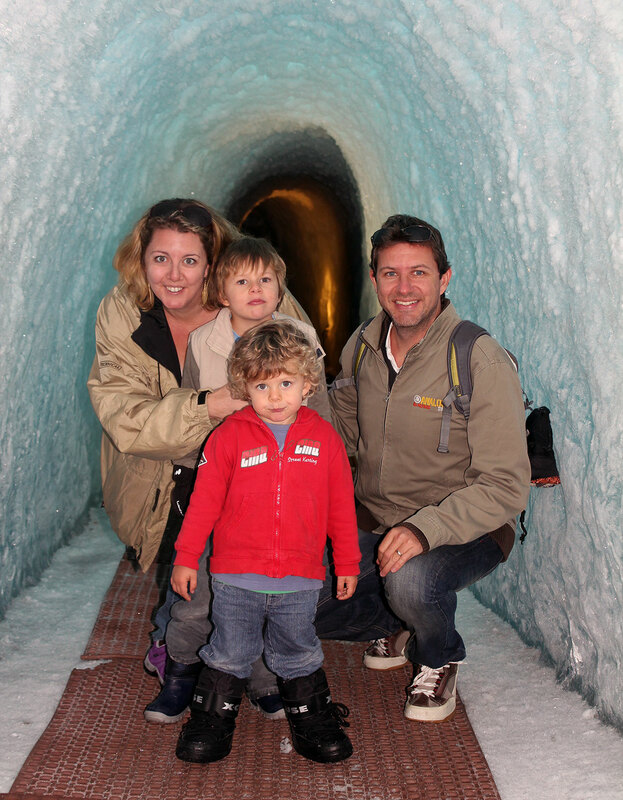 While we were up at Les Deux Alps we visited the Ice Caves. They had been recommend by a few people so we thought it was worth a visit. You need to take a the two Jandry Express chairlifts to get up there, but it is well worth the trip. The entrance is in the side of a snow field and if you weren’t careful you could totally miss it. Apparently the caves are carved inside a glacier that has been there for 1000s of years. We were relatively warm outside but as we went in it go colder and colder. The caves were awesome. They had lots of lights everywhere and also rubber mats on the floor so you didn’t slip. Scott decided that it was a fine idea to try eating the ice off the roof! And then encouraged Tom to lick the ice sculptures haha. He was very happy to obliged but his tongue started sticking to the ice so we quickly intervened. The 90’s movie Dumb and Dumber did come to mind! Many beautiful ice sculptures were carved into the walls; We saw fish, sharks, monkeys and a buddha (well I think it was a buddha!). Some of the sculptures had lights behind them so they were illuminated. It was really pretty and my photos don’t really do it justice. We explained to Tom about how glaciers exist and that this cave had been carved out of one. He was fascinated. I love talking to him about things like this along the way. We used to try and look up new things each day when were in Bali and Australia; I LOVE YouTube and Google as you can transport yourself and your kids instantly to somewhere else, however there is nothing like hands on experiential learning. He really enjoys it and loved touching the ice, the sculptures sand listening to the stories. If you are ever up in this part of the world I can highly recommend it. It is pretty difficult to get to if you aren’t planning on going up into the snow, but it is well worth the effort! We had a fantastic chalet with a huge kitchen so we ate at home a lot, however we often went out for lunch and enjoyed some amazing meals and delights . The little village at the bottom of our mountain was called Le Bourg De’Oisons. It was really charming with loads of lovely cafes and brasseries spilling out onto the cobblestone streets and alleyways filled with quaint shops and hanging baskets. The boulangeries are famous in France. Fresh Bread, Cakes, slices and biscuits. Everything smells divine and tastes even better. Tom was obsessed with Macaroons so we ate our fair share. For me it was the Mille Feuille (Vanilla Slice) and fresh bread that was the best. Chocolatiers were abundant in the alps and we managed to sample fresh nougat and lovely truffles. They smell amazing and it is like an adults candy shop! There were also some great supermarkets (Carrefour and Casino) in the area where we could get all our shopping done. The French eat very fresh food that appears to be made from very good ingredients and generally quite rich. The amount of cream, cured meats, cheese, wine and delicious goods that we found in the supermarkets was staggering. The massive range of cheese never ceased to amaze me. I love it! I love all the decadence and the richness. I love their passion for good quality food and their approach to eating. Unfortunately I might have loved it all a bit too much as by the time we left France my pants were super tight! Oh well …. I can diet in Italy right?